A historian looking back on the public battle over Barack Obama’s second-term appointments might very well scratch his head as he struggles to explain the fight over the president’s next Secretary of Defense. He will look at the columns written for and against the leading nominees and see something very strange. He will notice that liberals, by and large, are rallying behind a conservative Republican, and that conservatives are pulling for a liberal Democrat. The candidate usually cited as Obama’s back-up pick—the understudy, should his first choice prove too hard to confirm—is Michèle Flournoy. A loyal Democrat and a steadfast Obama ally who served as undersecretary for policy at Defense until early 2012, Flournoy boasts degrees from Harvard and Oxford, commands the admiration of much of the policy world, and stands to shatter the Pentagon’s glass ceiling as the first female Defense Secretary. Yet apart from a few stray liberals such as Rosa Brooks, Flournoy is drawing her most enthusiastic promotion, as TNR’s Molly Redden noted, from such unlikely backers as Bush administration veterans Paul Wolfowitz and Dan Senor. 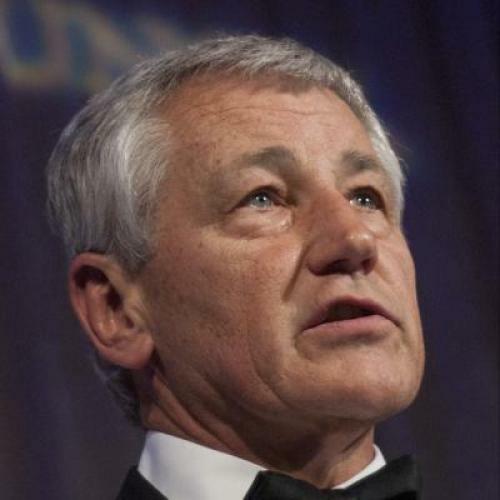 Meanwhile, the conservative Republican whom liberals and Democrats are rushing to champion is, of course, Chuck Hagel, a former senator from Nebraska, who appears to be the president’s preference to lead the Pentagon in his second term. Hagel boasts a middling intellect, an immense reservoir of self-regard, and a staunchly right-wing voting record. He boasts a lifetime American Conservative Union score of 84, having backed the Bush tax cuts, the Patriot Act, the authorization of the Iraq War, and most of rest of the right-wing agenda during his time in the Senate. He’s precisely the kind of person whose nomination would normally drive liberals into fits of outrage. But not this time. Liberals are bending over backward to praise Hagel, in effect saying they would prefer an archconservative male mediocrity to a liberal female rising star. Something funny is going on. The reasons why liberals should oppose Hagel are numerous. In the senate, he failed to distinguish himself except as John McCain’s Mini-Me (before Lindsay Graham assumed the role), a fairly conventional Republican who curried favor with the news media by striking a few maverick poses. Notoriously, he made an obnoxious reference to James Hormel, a Clinton-era ambassadorial nominee, as “aggressively gay” (Hagel apologized the other day, but Hormel remains unpersuaded). Then, too, it’s high time that Democrats stopped perpetuating the myth that they need a Republican to Defense to afford them certification as tough on national security. Franklin Roosevelt, seeking bipartisan unity in a time of world war, might be forgiven for appointing the eminent Henry L. Stimson as Secretary of War, and the subsequent choices of Robert McNamara, William Cohen, and Bob Gates can also be rationalized (OK, maybe not McNamara). But after an election campaign in which the Democrat was widely deemed to be far more proficient in foreign policy than his Republican rival, the decision to award this seat, of all Cabinet positions, to the opposition is especially foolhardy. Put Hagel at Veterans Affairs if you must. Conservatives have thus come to oppose Hagel for the most sincere of reasons while promoting Flournoy for deeply cynical, if not perverse, ones. In contrast, many on the left have come to cheerlead for Hagel for an even more cynical and more perverse reason: the nature of his enemies. Since the Iraq War, a sizable and apparently growing segment of the liberal punditocracy has lost its way on foreign policy. Politicians and writers on the left, including many liberals, have been so repulsed by the Bush administration’s policies abroad that they have often assumed, almost reflexively, that whatever Bush and the Fox News crowd favored was ipso facto wrong and its opposite ipso facto correct. This delusion seemed to turn many progressives into sour realists, intent on abdicating any American leadership role in the world, even a liberal and humane one. It especially infected their thinking on the Middle East, where they have been slow to recognize the dangers of Islamists like Recep Erdogan in Turkey and Mohammed Morsi in Egypt, eager to minimize the dangers of a nuclear Iran, and, in the case of one strain of progressives, displaying the inordinate animus towards Israel that was once confined to the far left, in places like the Nation and the Village Voice, but now finds a home on the New York Times op-ed page and other mainstream liberal outlets. It is this same perversity of thinking that has led too many liberals to fall in love with Hagel. Because the likes of Wolfowitz and Senor are against him, the thinking goes, we should be for him. (Never mind that Hagel is politically well to the right of Wolfowitz and Senor and most other so-called neoconservatives.) So, for example, on the Times’s op-ed page, James Besser, a former reporter for The Jewish Week, in a piece called “Don’t Let Pro-Israel Extremists Sink Chuck Hagel,” declines to argue the case for Hagel on its merits, offering only the perfectly unobjectionable argument that the lunatic right, which imagines Obama a Muslim and enemy of Israel, shouldn’t be allowed a veto over his Cabinet appointments. The headline itself implies that the decision should be a referendum on Hagel’s most obnoxious opponents—rather than a referendum on Hagel himself. Meanwhile, on the New Yorker’s website, Connie Bruck, a writer of personality profiles for the magazine, offers up, “Chuck Hagel and His Enemies,” reducing the criticism of Hagel as to “what can be called the Israel lobby.” Bruck doesn’t pause to consider whether Jews, or anyone of liberal spirit, might reasonably take offense at Hagel’s own terminology for these critics—i.e. “the Jewish lobby.” (She uses the specious defense, shoehorned in via a quote from Rep. Gary Ackerman, that most vocal supporters of Israel are Jewish.) Bruck then pens a valentine to Hagel, which mainly boils down to the fact that she doesn’t like Jennifer Rubin, Abe Foxman, and Bret Stephens—all Hagel critics. In personal conversations, too, one hears the same thing: Hagel’s appointment will deal the “neocons” a deserved blow. The enemy of my enemy is my friend. But this is short-sighted logic for choosing a Cabinet. Ironically, Hagel’s new friends on the left fail to see that his worrisome positions are rejected not only by many Republicans but also by Barack Obama, who has repeatedly insisted he will not tolerate a nuclear Iran, who has proved himself a reliable friend of Israel, and who has firmly refused to reward Hamas with recognition. And perhaps most unfortunately, in their zeal to deliver a defeat to the pro-Israel right, they are dealing a far more severe blow to someone whose views, from all we know, are far more in line with the administration’s—Michèle Flournoy.